John Ravenscroft mans the Shropshire FHS Stand at Olympia in 2011. 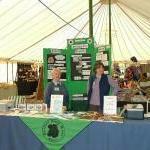 This is an unusually small stand for us, a single table, normally we have two or three tables, but we had to keep costs down. 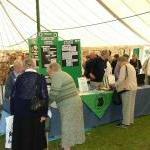 Shropshire FHS have decided not to attend the next WDYTYA?Live at Olympia, but intend to have a stand at the York Racecourse Fair in 2012.